Worcestershire Young Volunteer Award winner Jacob Ottley at Worcestershire CCC. 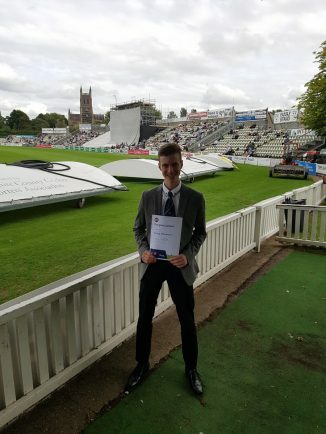 REDDITCH Entaco Cricket Club teenager Jacob Ottley won the Young Volunteer Award at the Worcestershire Cricket Board OSCAs (Outstanding Services to Cricket Awards) held at New Road. The 16-year-old will now go forward to the National OSCAs to be held at Lord’s in October. Jacob has been part of the Bromsgrove Road club for seven years, playing his part in junior age groups, but a couple of years ago he decided he wanted to work on the ground. Last season Jacob became an integral part of the groundstaff as he dedicated more than 100 hours to the task. Jacob recently took the AOG winter and spring course at New Road and he now forms part of the Kingfishers’ groundstaff team, helping produce some of the best wickets Redditch has seen for many years.